At Lindy Sue’s Products For Clean-Living, life just seems cleaner and brighter. Check out Lindy Sue’s handcrafted line of unique gifts and laundry accessories (she calls it laundry chic). Starting with her specialty Come Clean Kit– developed and tested in her own home laundry room – and evolving into an entire line of great gift ideas including the retro dishtowels (pictured) and the Wash ‘n Wear Travel Bags – perfect for the person-on-the-go. 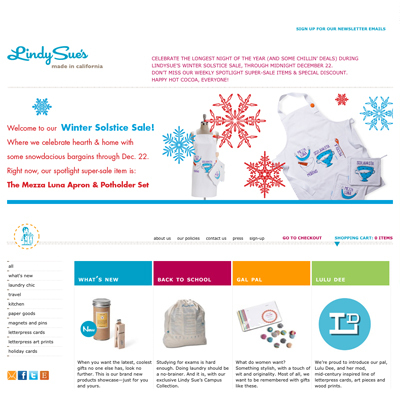 All products are thoughtfully created and beautifully designed, by Lindy Sue herself. For more information visit her at www.lindysues.com or write her at lindy@lindysues.com. Attention Indie Designer Label Shoppers: use coupon code Indie06 at check-out to receive your exclusive promotional discount!